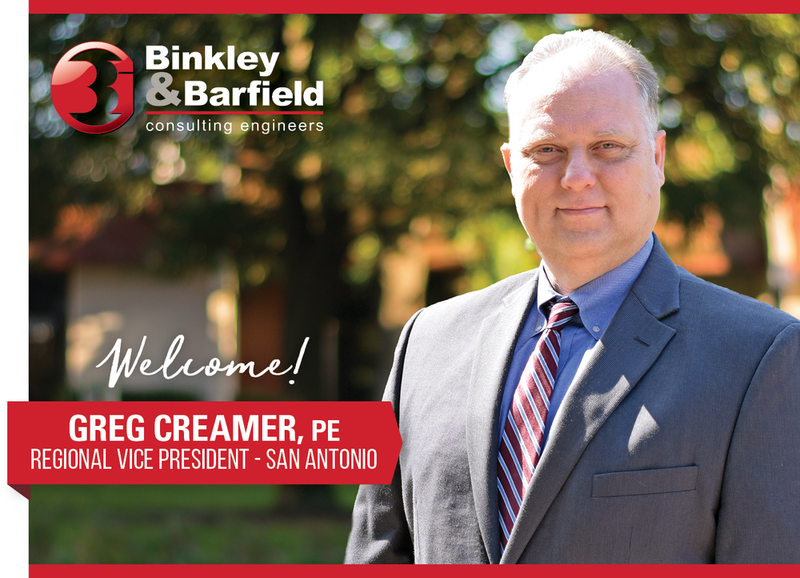 Welcome: Greg Creamer, PE — Binkley & Barfield, Inc.
Binkley & Barfield, Inc. (BBI) is pleased to announce the addition of Greg Creamer, PE to the position of Regional Vice President for our South Central regional office located in San Antonio. Greg has over 32 years of experience in civil and structural design for highways, railways, and associated structures. He has been responsible for the structural design of several large highway interchanges and has provided project management, construction management, bridge inspection, and value engineering for various types of projects across Texas. Greg‘s transportation and general civil projects, encompassing a variety of design disciplines and construction techniques, have been completed for various city, state, and county agencies as well as the U.S. Army Corps of Engineers. He continually works with clients such as City of San Antonio, Bexar County, Port San Antonio, Alamo RMA, and TxDOT. As the leader of the BBI’s San Antonio office, Greg will be responsible for overseeing the daily operations of the office, identifying market trends, developing and implementing strategic goals, monitoring and supporting the pursuit of business opportunities, and recruiting. He will also partake in training, managing and developing professional staff, project quality auditing, and the implementation of various quality processes and procedures. We look forward to Greg building collaborative relationships across the Binkley & Barfield Family of Companies, as well as with industry peers and our clients.